For those of you jealous of the devices featuring dedicated camera buttons and other gesture shortcut features, fret not. 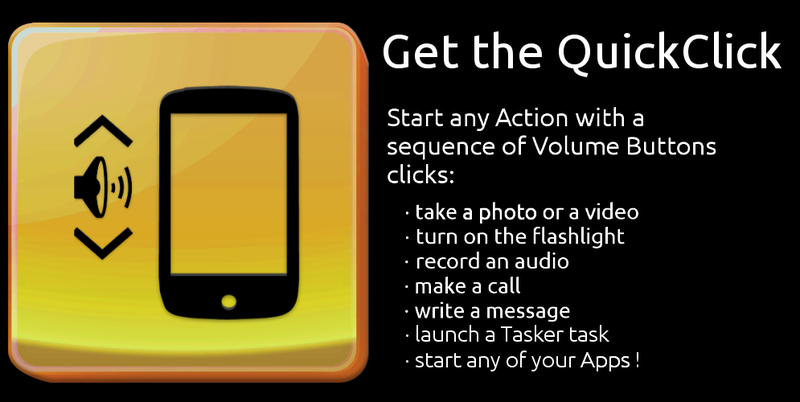 QuickClick will let you use your volume buttons in specific sequences as triggers for your camera and much, much more. The free app will let you toggle your flashlight, start any of your apps, record audio, and even connect to Tasker to run any other device functions, exponentially increasing the power of this little tool. Choosing an action from the wide assortment of those available will let you fine tune settings for it, and then you are thrown into a screen where you can define which combination of volume key presses will trigger said command. It’s as simple as that. The possibilities really get interesting when you consider the app’s integration with Tasker. For those of you familiar with Tasker, you know that you can basically set the app up to do many things (such as control all system settings) on your phone, though some actions may require root access. That’s a win. The app is available on Google Play for free, so it’s worth giving it a shot and assigning a few simple functions to it. The full list of features can be found right down below.